The author, Gary Taaffe gave me a copy of this novel in exchange for my review. If you ask 11-year-old Alex she will tell you that Four Small Stones: Billy’s Gotta Find Some Girls (Urban Hunters) (Volume 1) is gross. Not a negative gross, but certainly stomach churning. She will talk about the exploding kangaroo (those decomposition gasses are brutal), the cutting of Billy from his dead mother’s belly, the crushing of mammal brains to feed the child and other things. She will tell you that the story was vivid and that she laughed in spite of herself when the kangaroo exploded. Alex has labelled Four Small Stones: Billy’s Gotta Find Some Girls (Urban Hunters) (Volume 1) a novel for someone with a stronger stomach than herself. As that person with a stronger stomach, I loved this novel. It was vividly written with the feeling of education on Aboriginal history as well as life in the Outback. I once heard Peter Jackson say that the success of the Lord of the Rings trilogy was born from the sense that it is accessible foreign world with language and routine to which the reader can relate. This concept holds true for Taaffe’s work. Kids will not have lived in Billy’s world but the way that Taaffe sets the story, young readers will think and likely relate their own lives with that of Billy. Billy has mischievous and sometimes bothersome older brothers looking to one-up each other and him. He has a grandfather who loves him and shares an oral history with him. He has a family who has had to do what it has to do to survive; and Billy will do anything to help them. The first novel doesn’t send Billy into the wide world, instead keeping him at home and providing the reader with a clear view of what a culture shock Billy will face. There are no corner shops in the Australian bush. If you want to get somewhere, you go by foot. This first installment of the series is simply fun and instructive. After reading this novel, my Canadian Alex expressed sympathy for the Aborigines in the story and an interest in learning more about the history of the people. Taaffe includes a list of terms at the end of the novel that isn’t necessary, but is suggested for young readers to peruse before embarking on the wonderful read. 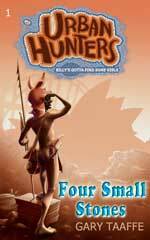 Four Small Stones: Billy’s Gotta Find Some Girls (Urban Hunters) (Volume 1) is a great middle-grade read. I would also recommend this fun and fast read for adults. 42-year-old Tammy liked it a lot. Buy this fun adventure novel today. For more information about Gary Taaffe and his work, visit his blog. You can connect with him on Goodreads, Facebook and Twitter @urban_hunters.